Towards the end of his career, Keith Haring continued to draw upon his explorations of graffiti and street art. When Haring first arrived in New York, it was home to a thriving underground art scene. Haring befriended fellow emerging artists like Jean-Michel Basquiat and Kenny Scharf, who shared his interest in the colorful and transgressive graffiti art of the city’s streets. A totem is a spirit being, sacred object, or symbol that serves as an emblem of a group of people, such as a family, clan, lineage, or tribe. Haring often referenced the totem within his work as a way to capture the spiritual and sacred significance of the community in which he belonged to. 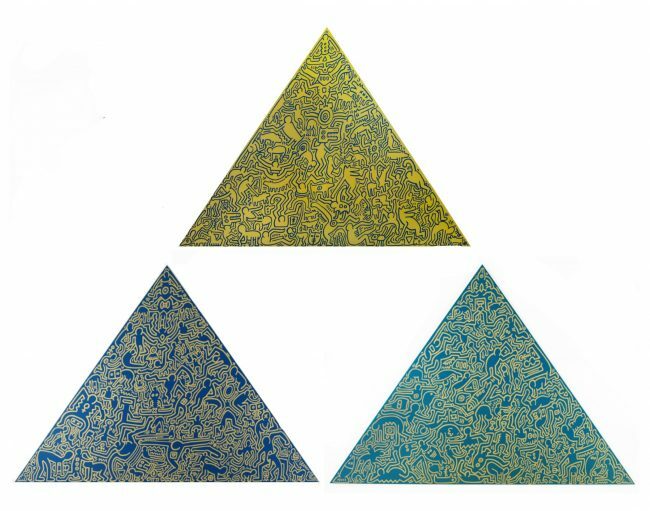 Totem, 1989, is presented as a three-part woodcut on Inshu-Koza Japanese paper. This limited edition of 60 shows Haring’s iconic symbols confined inside the silhouette of a totem. In 1990, the year before his death, Haring published a series of pyramids. These rare screen prints are printed on anodized aluminum features dozens of the artist’s iconic characters dancing in a celebration of life. Arranged within a large pyramid, the exuberant figures are rendered in bright colors against an equally rich background. 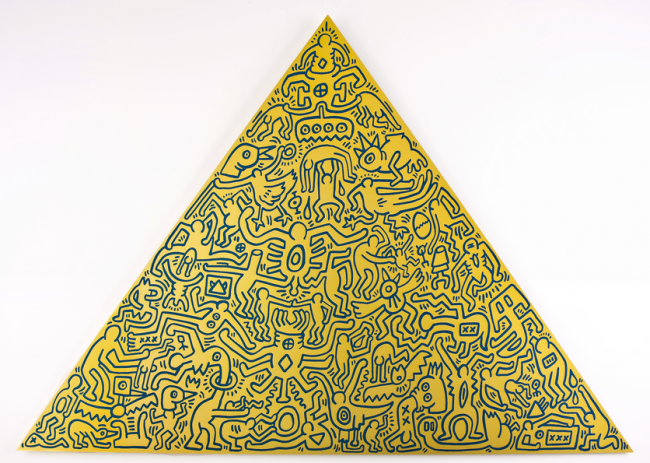 The pyramid was a common theme in Haring’s work, simultaneously referring to antiquity and symbolizing eternity. Within these works Haring returned to his signature figures and symbols. His kinetic characters offer a linear style, Haring’s pyramids and totems presents a stunning display of the artists graphic sensibility. 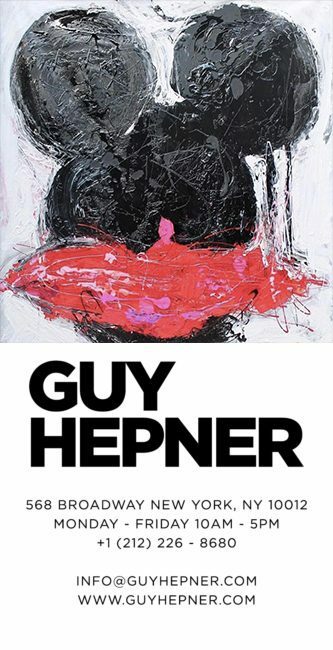 Guy Hepner is please to offer Keith Haring Pyramids and Totems. 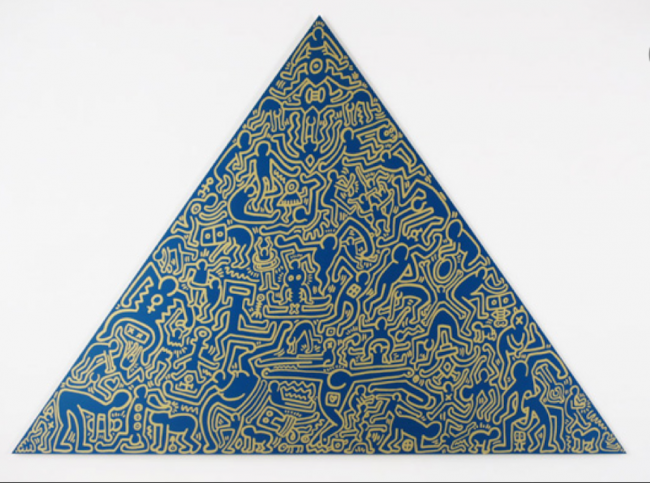 Inquiry today to purchase original artwork by Pop artist Keith Haring.